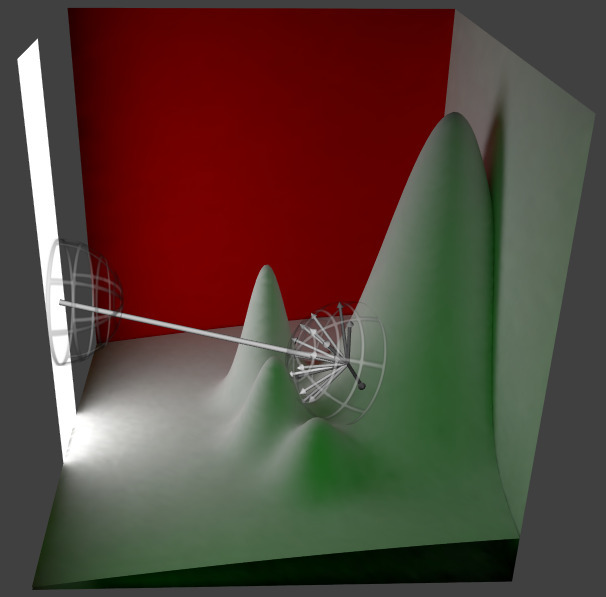 Level set of a nucleons dataset rendered with local illumination (left) and global illumination (right). 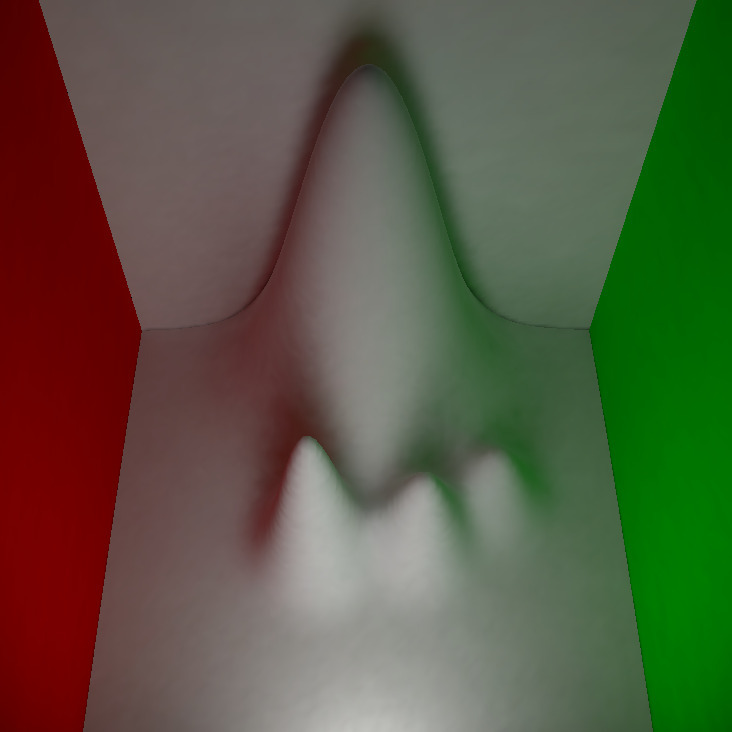 Adding global illumination required only an additional 50 milliseconds after isosurface extraction to display, using a precomputed 3D texture map. 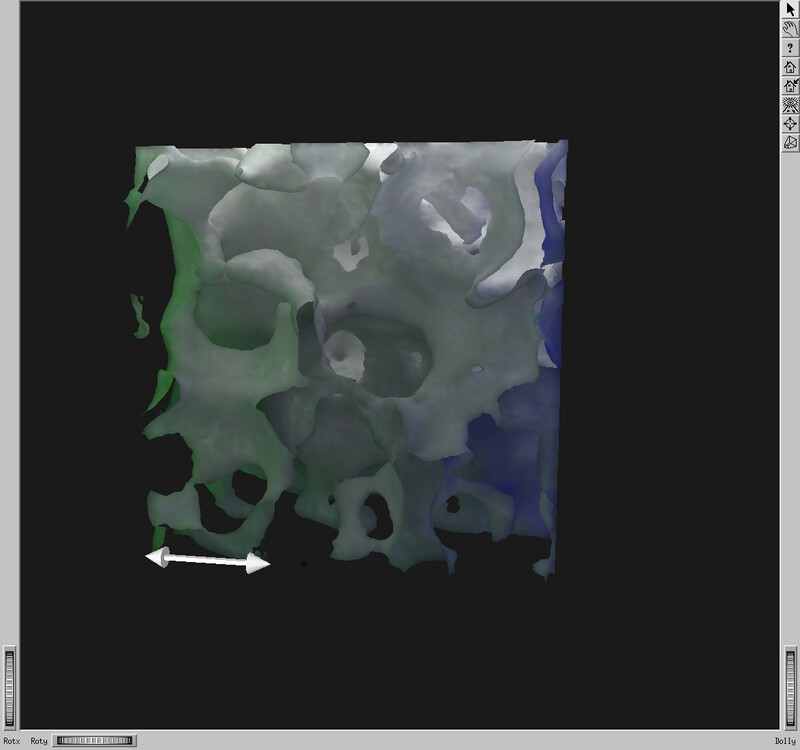 The 3D texture map was precomputed in 2.7 hours using a novel technique to render the graph of the dataset in four dimensions using photon mapping. Dataset courtesy Dr. Jorge Piekarewicz and Brad Futch at Florida State University. 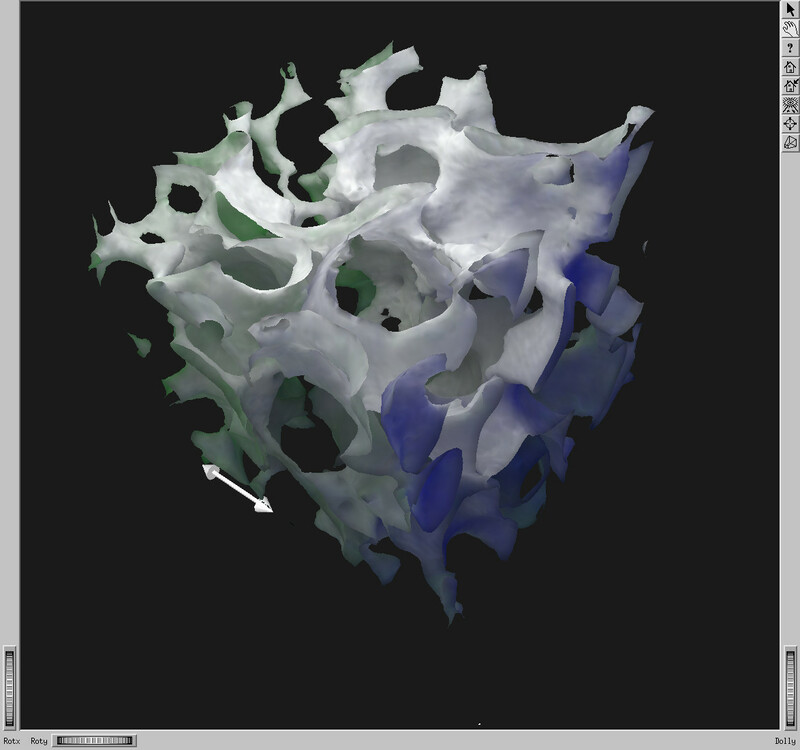 Three dimensional scalar heightfields, also known as volumetric datasets, abound in science and medicine. Viewing the isosurfaces, or level sets, is one of the two main ways to display these datasets, the other being volume visualization. 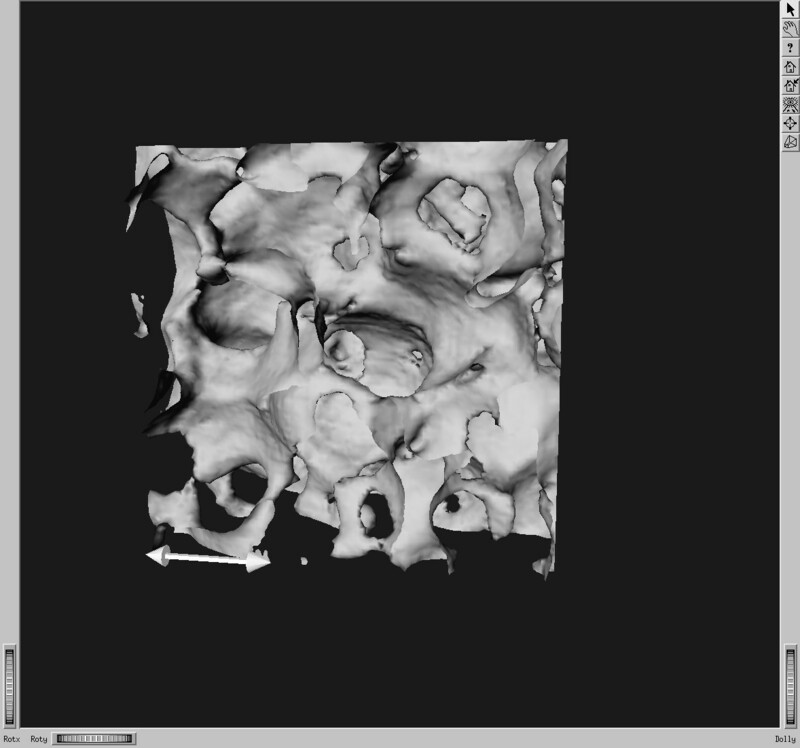 Typically the isosurfaces are rendered on a personal computer (PC) allowing the scientist or doctor analyzing the dataset to interactively change the isovalue, and rotate or zoom the isosurface. 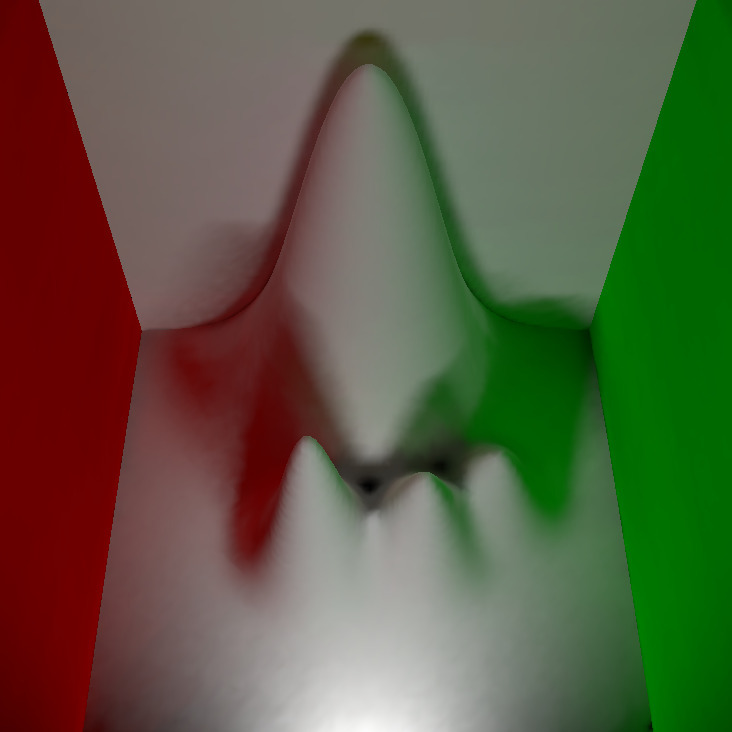 Unfortunately, out of necessity due to the PC's video card, current techniques render the isosurfaces with a basic hardware-accelerated lighting model. This lighting model lacks important features such as shadows, and as a result the isosurfaces are more difficult to interpret than if they had been rendered with a physically based lighting model. My thesis is that isosurfaces can be displayed with realistic illumination at interactive rates on a typical PC. 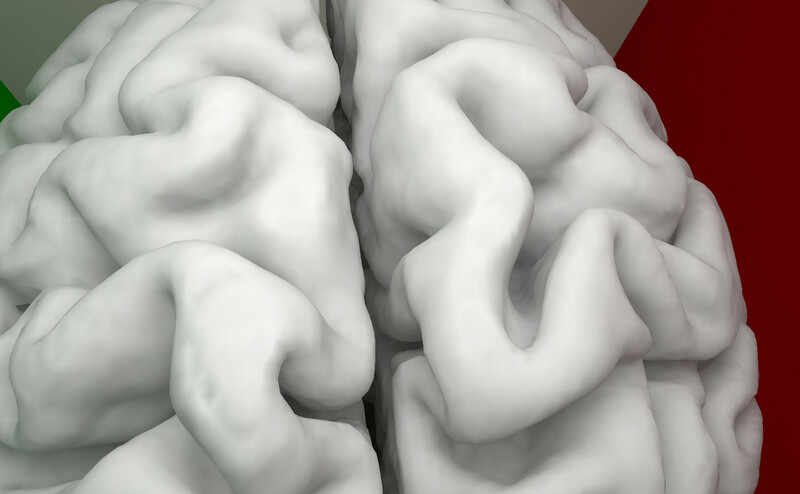 I present a method for applying global illumination to interactively created isosurfaces, using a physically based lighting model, with a negligible increase in the time required to render the isosurfaces. The result is convincing shading that is easy to interpret by the human visual system, including features such as soft shadows, inter-reflection, caustics, and color bleeding. 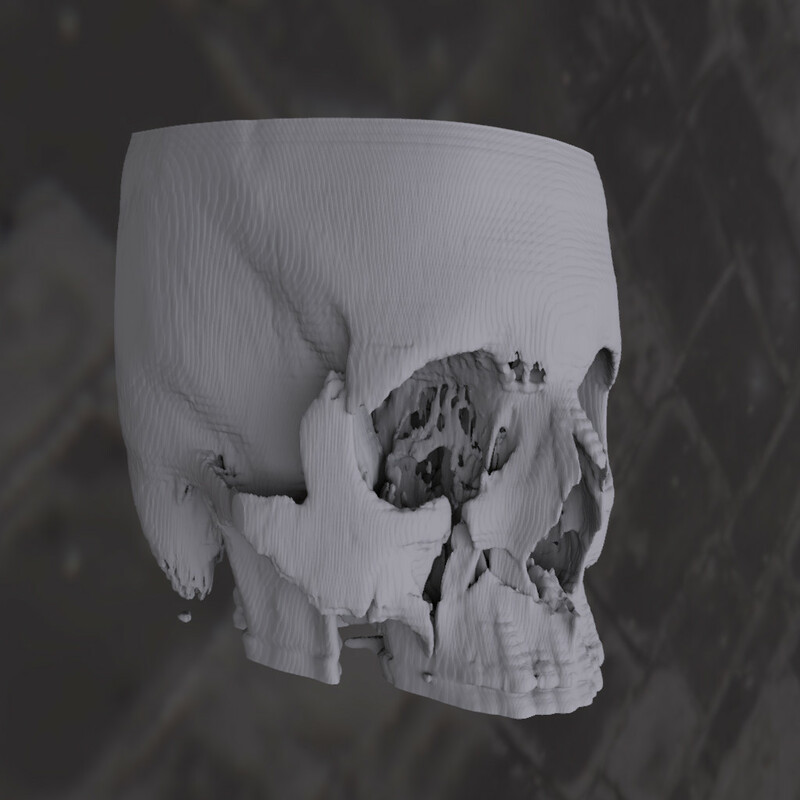 This is achieved by solving the rendering equation for all isosurfaces within the volume, storing the solutions in a 3D texture, and then texture mapping the result onto a polygonal approximation of the isosurface. This process is called ``heightfield rendering''. Status Successfully defended on 7/26/05. 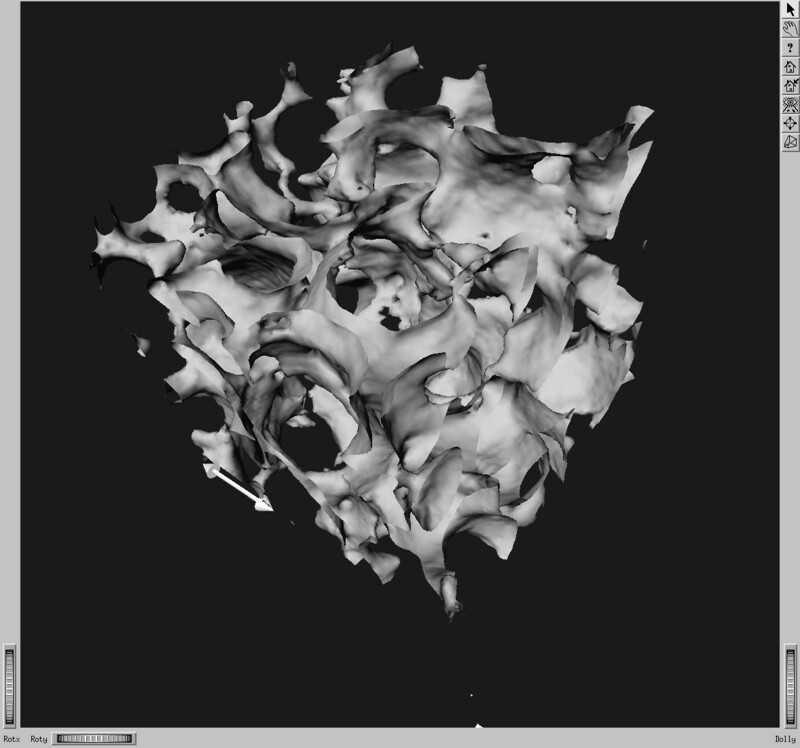 Here are two before and after comparisons of visualizations of 3D scalar data. 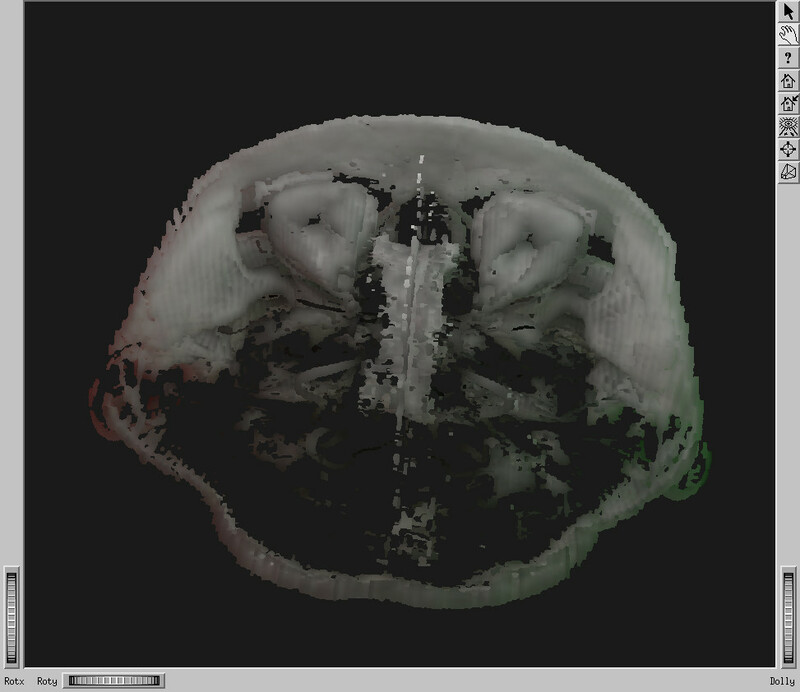 The dataset on the left is a MRI of a brain from McGill University, and has resolution 217x217x217, with a texture precomputation time of 90 minutes. 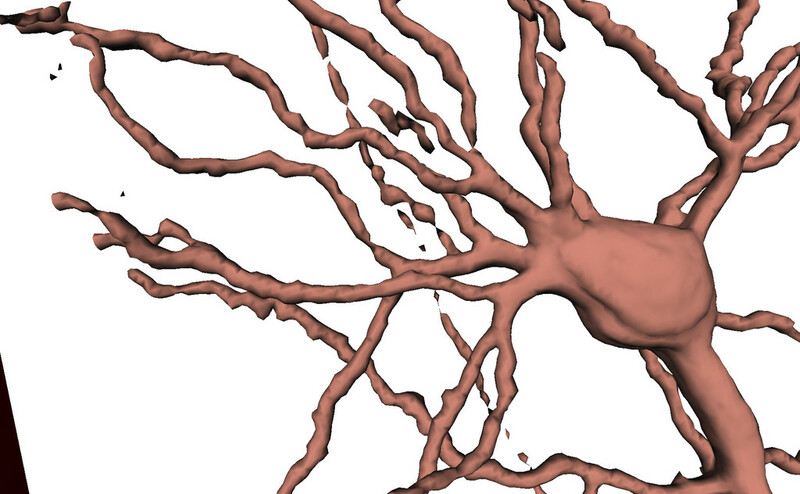 The dataset on the right is a scan of living mouse neuron from Debra Fadool and Wilfredo Blanco at Florida State University, with resolution of 150x150x150. Here illumination texture required 77 minutes to precompute. In both cases the added time to apply the illumination after arbitrary isosurface extraction was about 10 milliseconds. 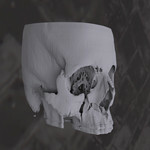 The images below are from a ceramic dataset of resolution 100x100x100. Since both sides of the isosurface are often visible, two textures were created: one for each side of the isosurface. Texture precomputation required about 2 hours on an 8 processor SGI prism. Here are two more datasets. 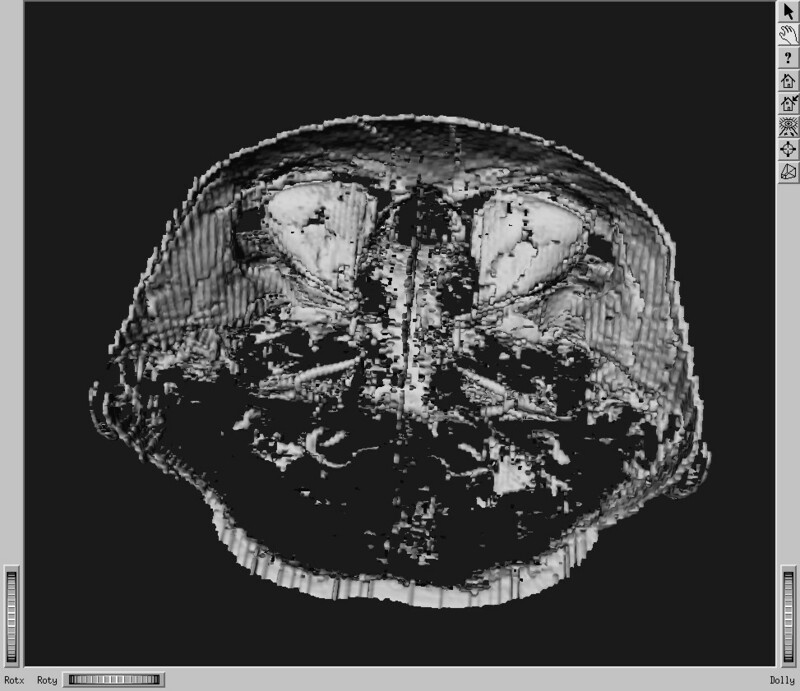 On the left is a MRI scan of a human head from the Stanford volume data archive, with a resolution of 256x256x109. The time to compute the 3D texture containing the illumination was 4.3 hours on a dual Xeon 3.0 GHz. Each of these movies shows a typical user-interaction with a dataset. 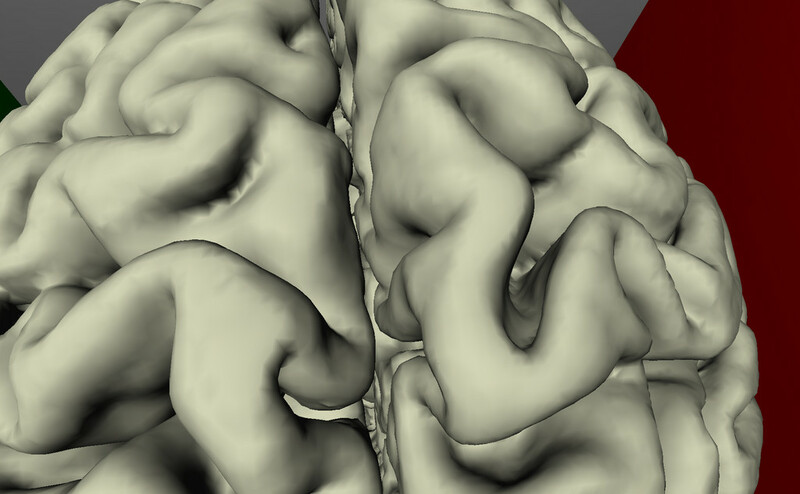 The isosurfaces are first examined using ordinary OpenGL diffuse shading. The dataset is then examined using a 3D texture computed using my new technique. 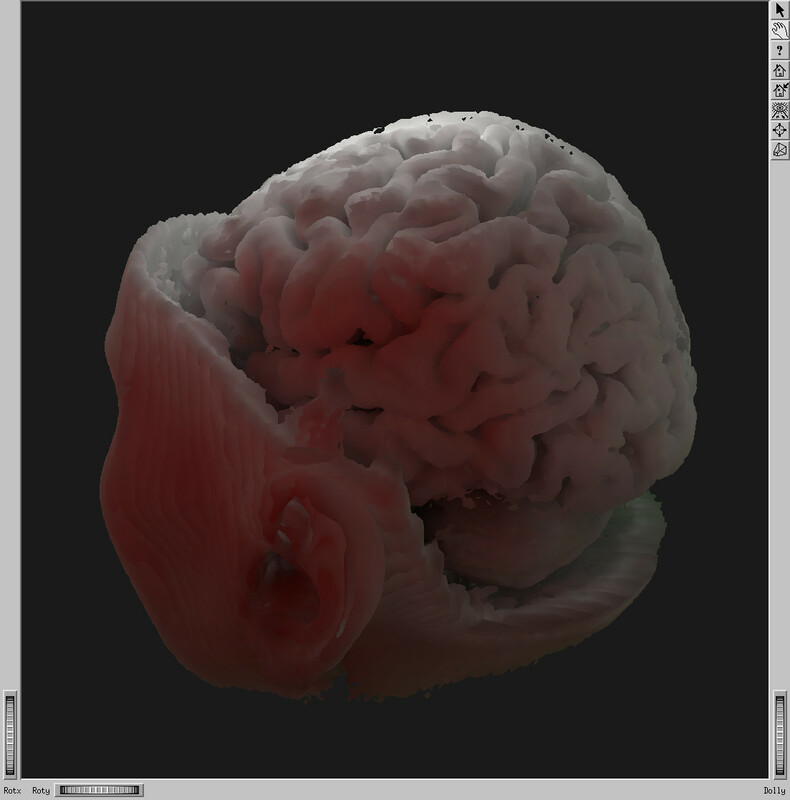 As part of my thesis, I implemented a volume ray tracer to create the 3D textures. 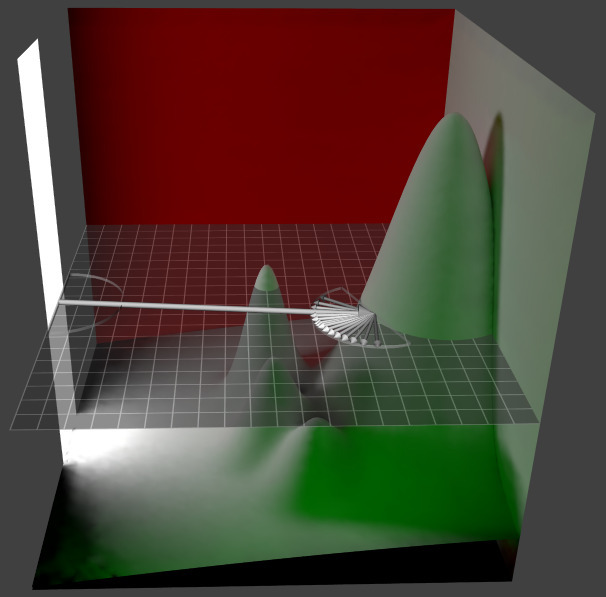 The ray tracer uses hierarchical spatial subdivision of the volume dataset and scene geometry to perform both ray-geometry and ray-isosurface intersection. 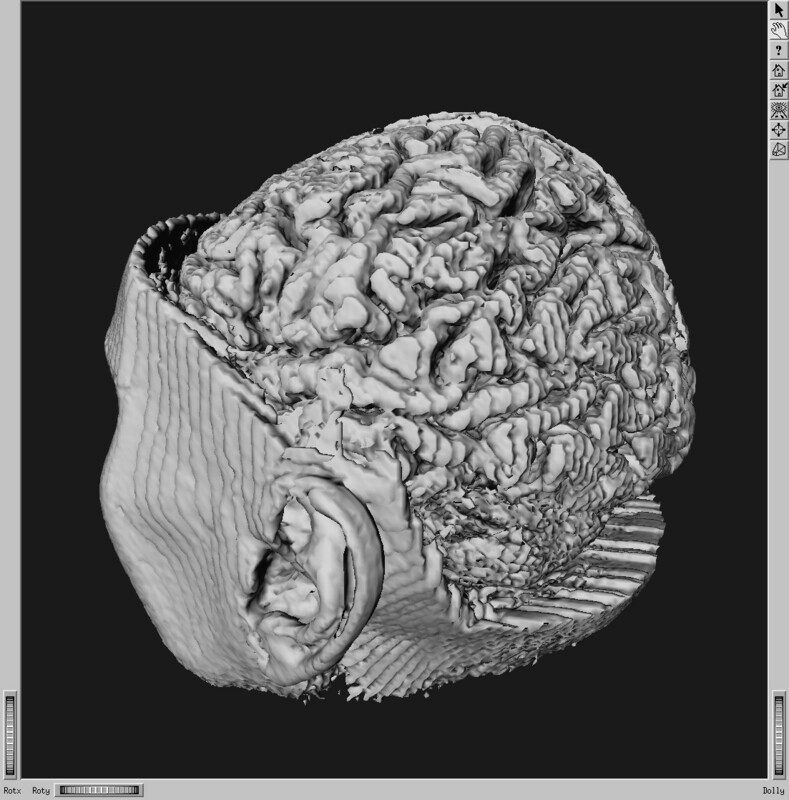 In addition to creating 3D textures, this softare can render images, such as the following, which uses the Uffizi light probe for image based lighting. I also implemented photon mapping in two dimensions (2D), for illustration purposes in my thesis. In this "flattened" light transport, light remains within the same 2D plane as it is emitted (except for a final bounce to the camera so that it may be viewed from any angle). To do this I had to come up with a 2D emittance distribution for both the direct illumination calculation and photon emission, 2D reflection capabilities including a 2D brdf and 2D photon scattering, a 2D irradiance estimate (new) for estimating the irradiance using the photon map, and a 2D final gather. The following images demonstrate the differences of 2D lighting versus ordinary 3D lighting. The most noticable difference, shown in the bottom right image for the 2D case, is the prominent shadows and colored indirect illumination in the shadow regions. These shadows are pronounced because the light, which extends from the floor to the ceiling, is unable to shine over the bumps into the regions behind them, since 2D light cannot flow up or down. As a result, these regions only receive indirect light which has a colored cast, an example of color bleeding. 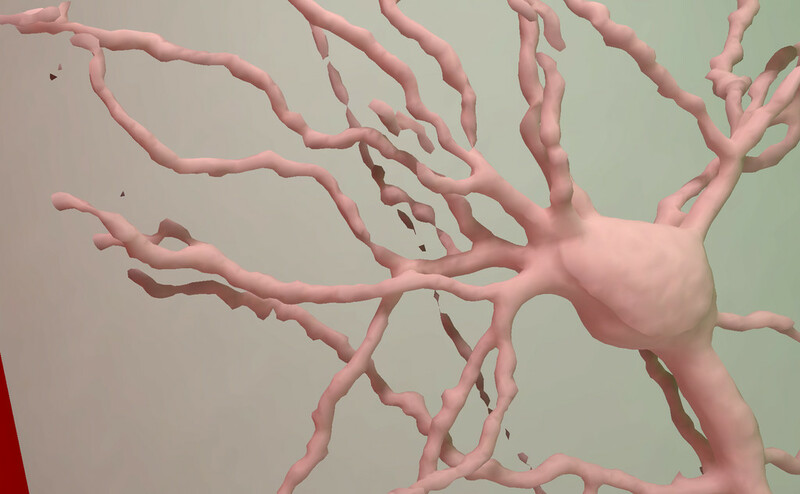 This research was supported by the SCS Visualization Laboratory and by NSF Grants #0083898 and #0430954.